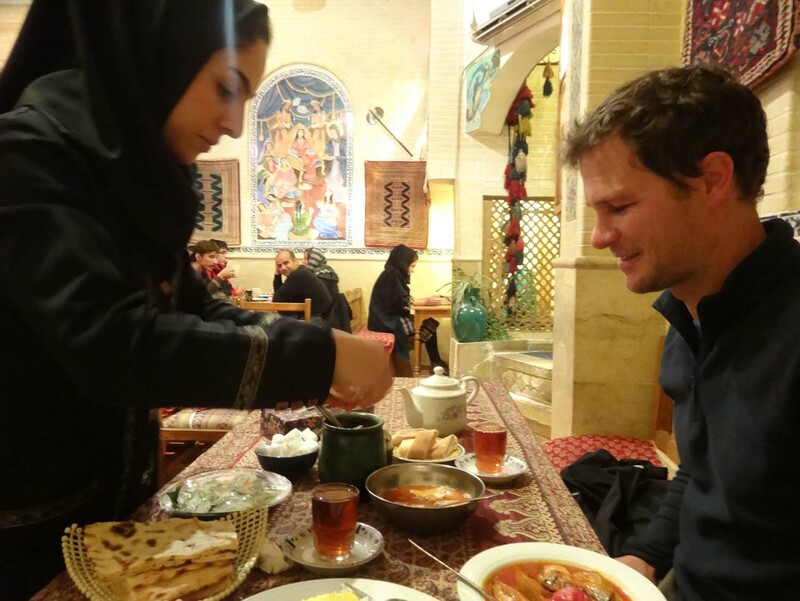 Iran, another place on our trip where it is not great to be a vegetarian, and many times Jude wished she could eat meat so she could enjoy the tempting Iranian cuisine. 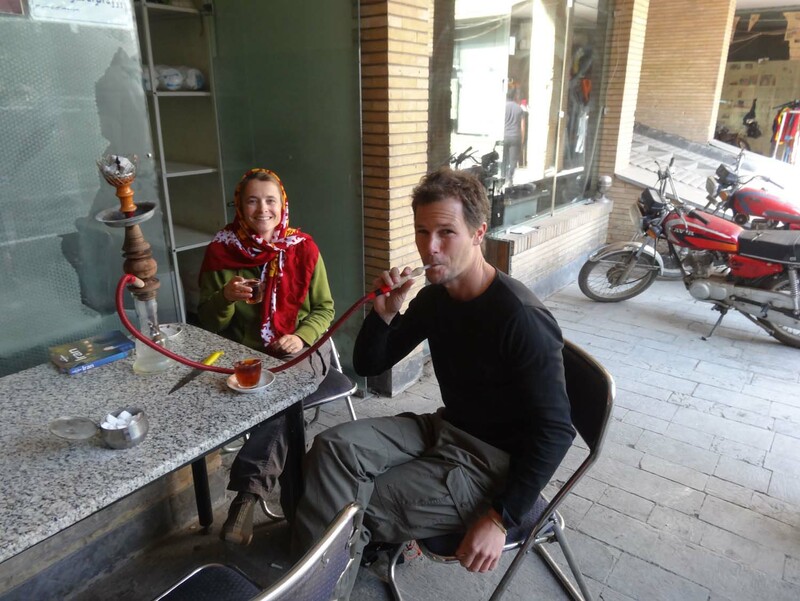 But luckily the food in Iran is not all about meat. They also have an incredible sweet tooth and everywhere you go another specialty dish or sweet (shirini) is available. 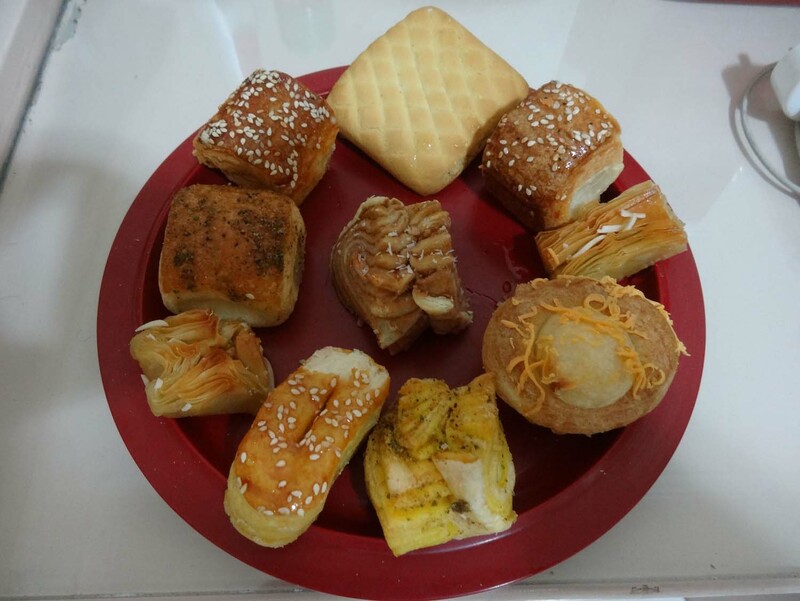 We had to sample them all of course and gained several kilos in the process. We’re also afraid of our next dentist’s appointment as the amount of sugar we have consumed here in Iran is the same as we’ve eaten on the rest of the trip. 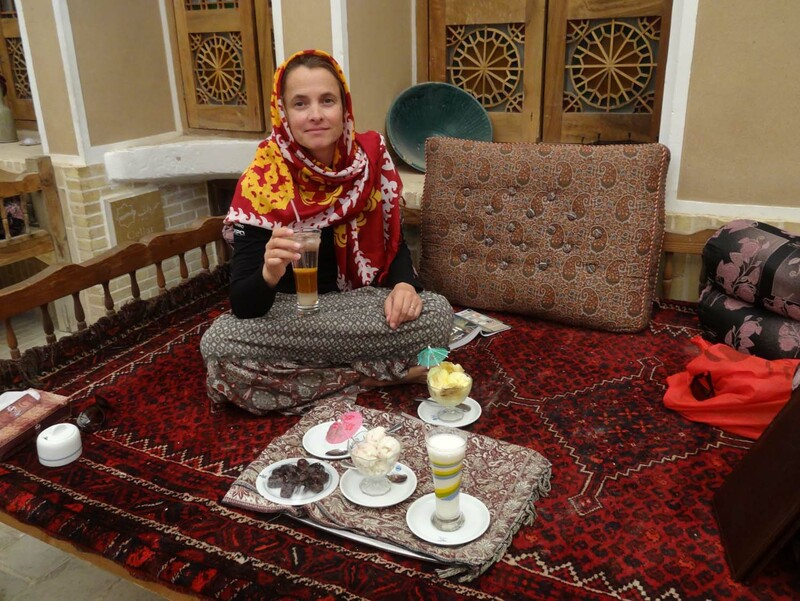 As the rain was pouring down outside, we found shelter in a tiny traditional teahouse in Shiraz. We were keen for a cup of tea, but discovered a small food menu and decided we would stay for lunch too. Jon asked for dizi and Jude was lucky as they had a vegetable stew on the menu which turned out to be a pretty tasty eggplant dish (mirza ghasemi – mashed eggplant, squash, garlic, tomato and egg). Jon in the mean time was about to arrive in food heaven. His dizi was set out in front of him and consisted of several dishes. Two bowls came out, one empty bar a spoon and masher and one with an assortment of mint leaves, onion and other raw ingredients. A basket of bread was added and the dizi itself. Dizi is actually the name of the pot in which is cooked the most delicious concoction of chickpeas, spices, meat and beans. As Jon looked rather puzzled, our kind waitress helped him out. First bits of bread are torn off, placed in the empty bowl and some raw veggies are added. 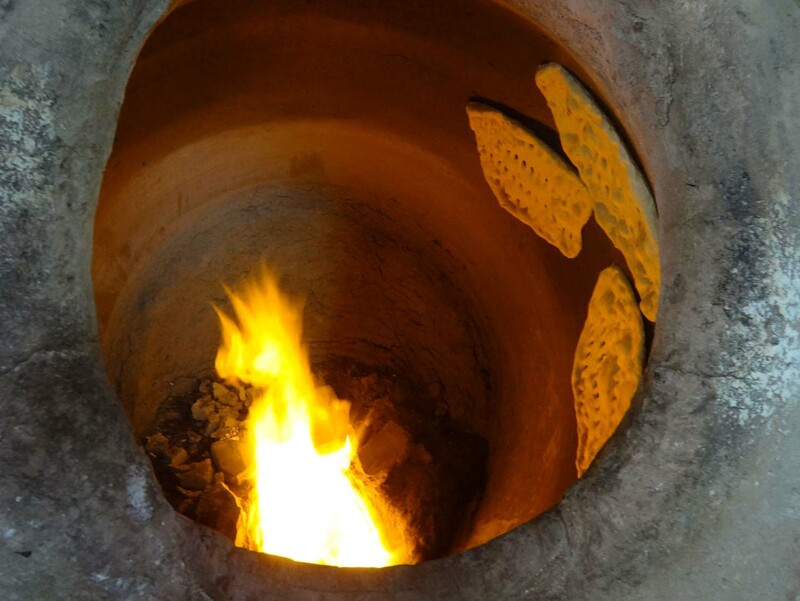 You then tip the liquid out of the dizi into this bowl and you have a delicious soup to eat. Now you can use the musher to attack the remaining solid ingredients. You mush them together into a delicious puree which you then scoop up with the remaining pieces of bread. Two courses in one! As Jon ranked this as one of the 10 best meals of the trip, Jude was very keen to try it. With some napkins ready a tiny bit was tried. Jon wasn’t lying, it was sensational. 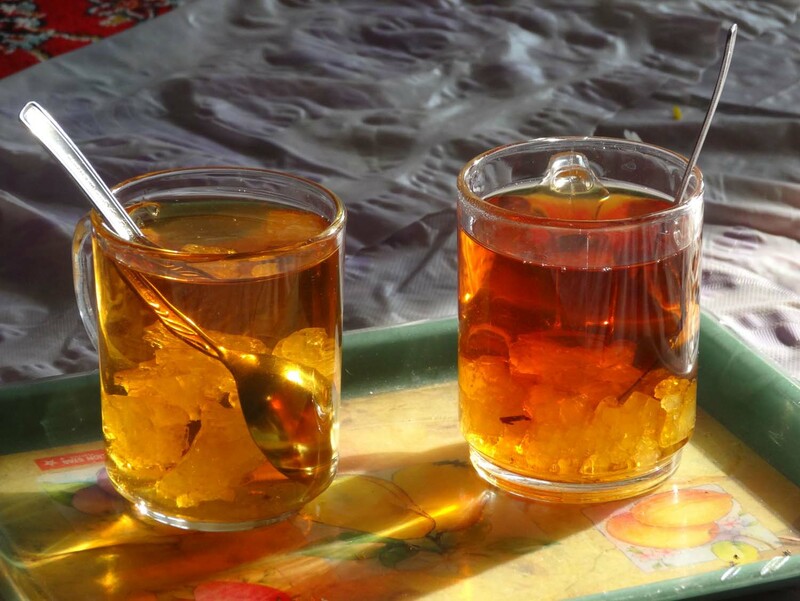 This alone is a reason to come to Iran, together with the best specialty dish of Kashan: nargali. 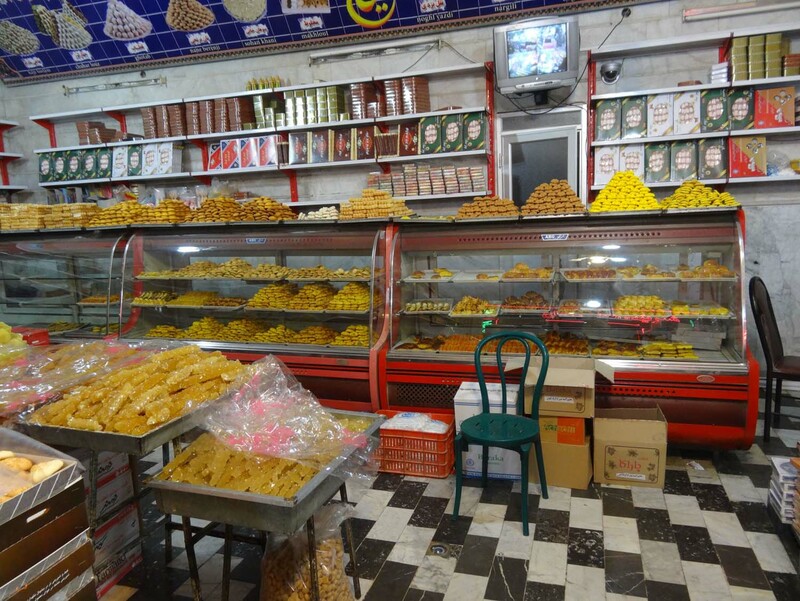 If you like coconut macaroons as much as we do you must try nargali in Kashan. This is their specialty and boy do they know how to make some melt-in-your-mouth coconut macaroons. We had bought half a kilo, but before we even got back to the car we had to buy some more. They all disappeared very quickly, and this time it wasn’t just Jon who could be blamed. We also tried gaz from Esfehan, which is nougat with pistachio nuts. The higher the percentage of nuts, the better the quality. We bought a box of course and before Jude had the chance to eat one piece it was already empty. One small bite is all she ever got to taste. 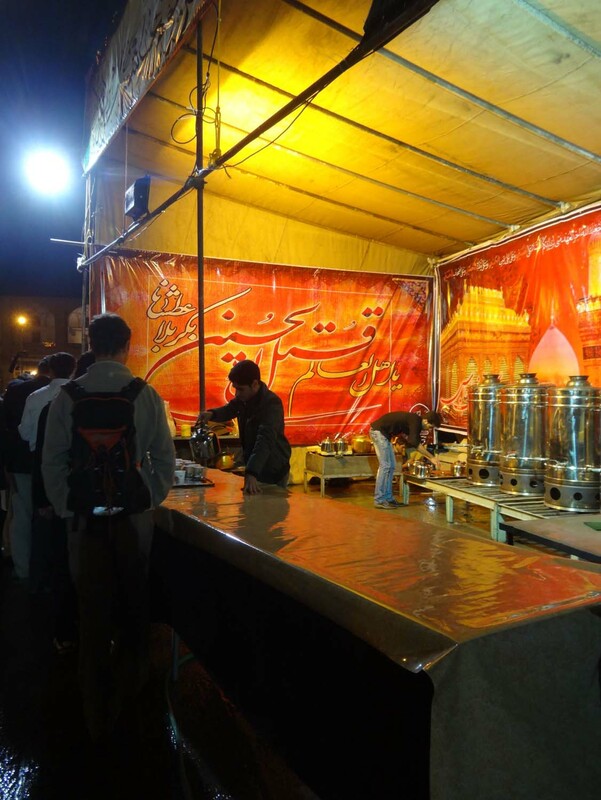 But when we tried faludeh in Shiraz, we ordered a small bowl each. 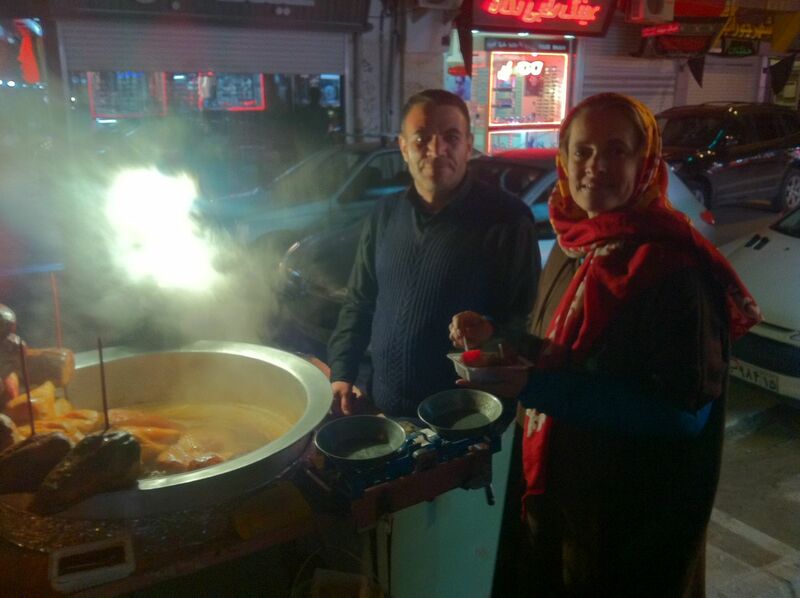 Faludeh is frozen sorbet, made with thin starch noodles. Probably not the best thing to eat when it is raining cats and dogs outside, but tasty nonetheless. 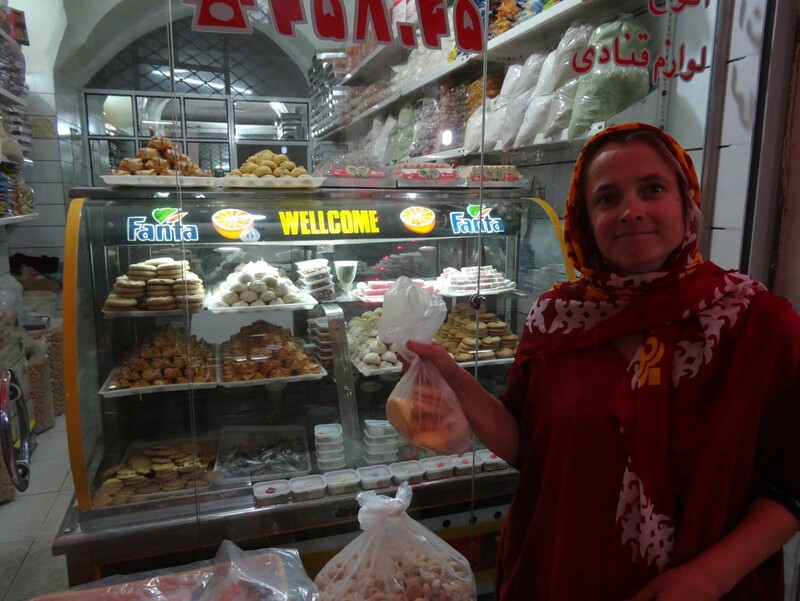 Shakila had told us we should try lemon and cherry, her favourite flavours, and they were great. They also pour rose water over it, but we preferred it without. In Esfehan we were invited for lunch by Marziye and Mehdi (her father), whilst stuck in a traffic jam. We followed them and had the best dugh and homemade cherry jam (from their own cherry orchard) in their home whilst Jon was enjoying the kebabs and they found egg and potato omelets for Jude. Dugh is a yoghurt drink, mixed with some water, but they had also added fresh peppermint and some more herbs. Delicious. Esfehan was the first town where we saw the traditional chaykhanehs. 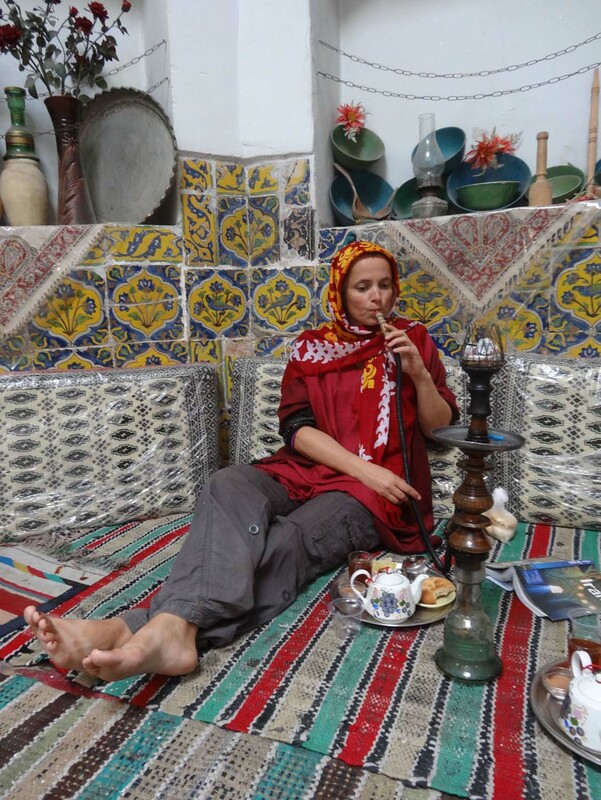 In these teahouses men come to drink a cuppa and smoke a qalyan (water pipe). The qalyans had been forbidden for a few years, but were now everywhere again although we didn’t see any until we reached Esfehan. We certainly enjoyed the relaxed atmosphere in these places and tried all the different flavours on offer whilst sipping many cups of strong tea from tiny glass tea cups. When we drove through Fuman we bought some Kluchech Fuman, literally cookies from Fuman. These have walnut paste inside and are pretty good. And in Orumiyeh we bought some noghl, nuts coated in icing sugar using copper cement mixers. The ones we tasted had a strong rosewater flavour which we didn’t like too much though. 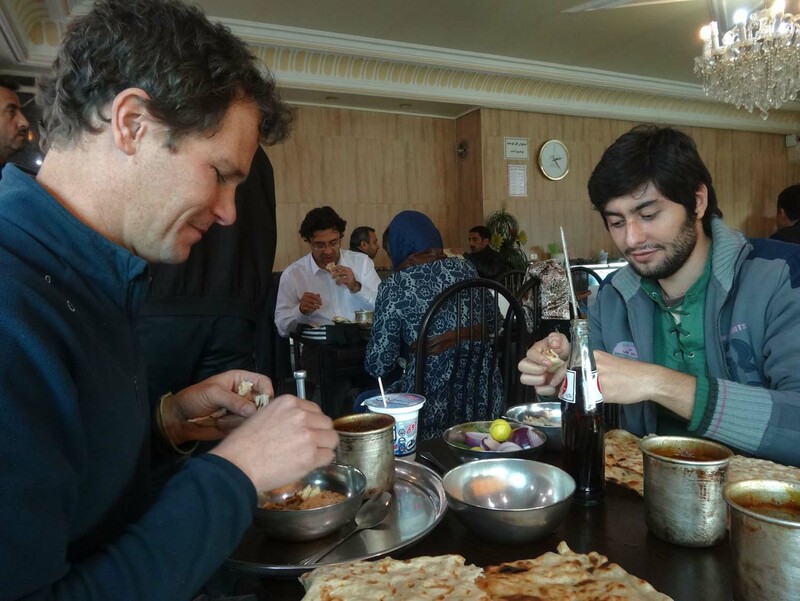 In Tabriz we tasted many Iranian dishes. Sina and Mohammad took us to the best dizi restaurant in town and across the little lane was a place that served Ash, a vegetarian specialty just for Jude. Ash . Jude is fantastic thick noodle soup with vegetables, served with yet another type of bread. We also saw many people making and eating yeralma yumurta. Literally meaning potato and egg. 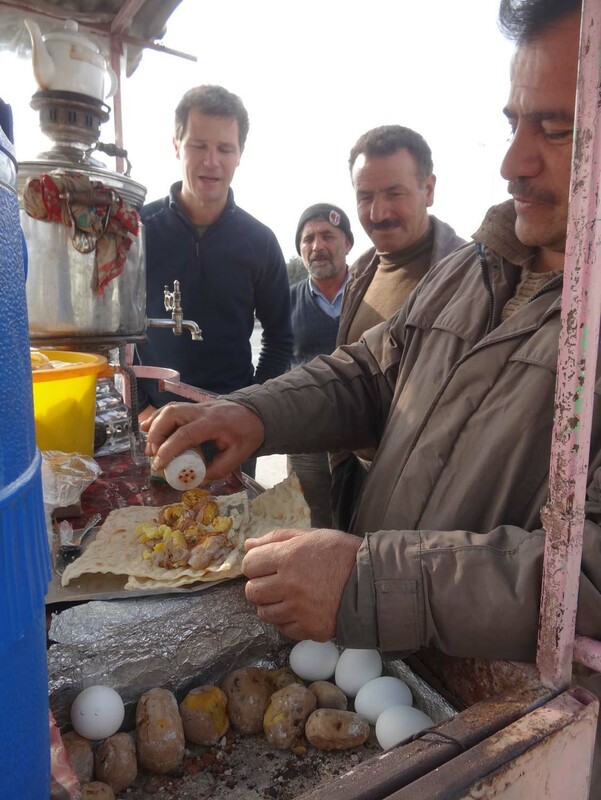 They put the mixture inside flat lavash bread and add copious amounts of salt, pepper and chili. We tried some with pickles and others were served with fresh herbs. A great lunch and every time we had it, somebody paid for us before we could even get our money out – the amazing hospitality was everywhere. 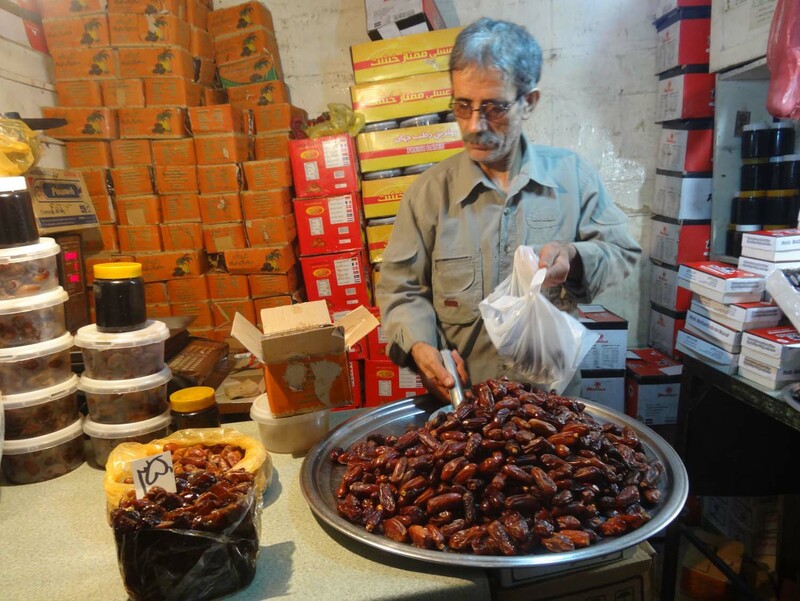 Dates were also everywhere and Jon was buying them by the kilo, tasting one of each pile before deciding what to buy. The only thing he didn’t try was a dish called ‘yoghurt stew’. 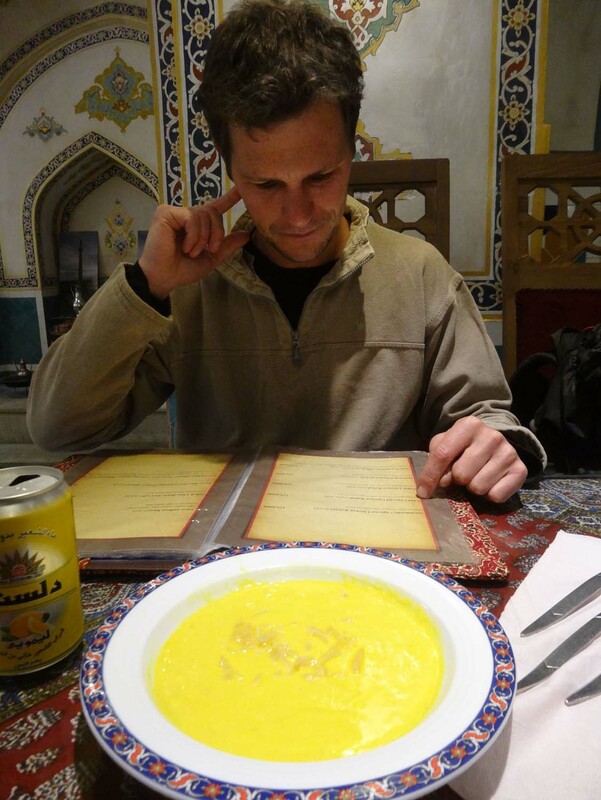 After first ordering a dish they didn’t have in a beautifully restored hammam in Esfehan, he had picked this yoghurt stew, assuming it was meat, vegetables in a stew that contained yoghurt… It looked more like cold custard, so it was politely sent back and kebabs were ordered instead. 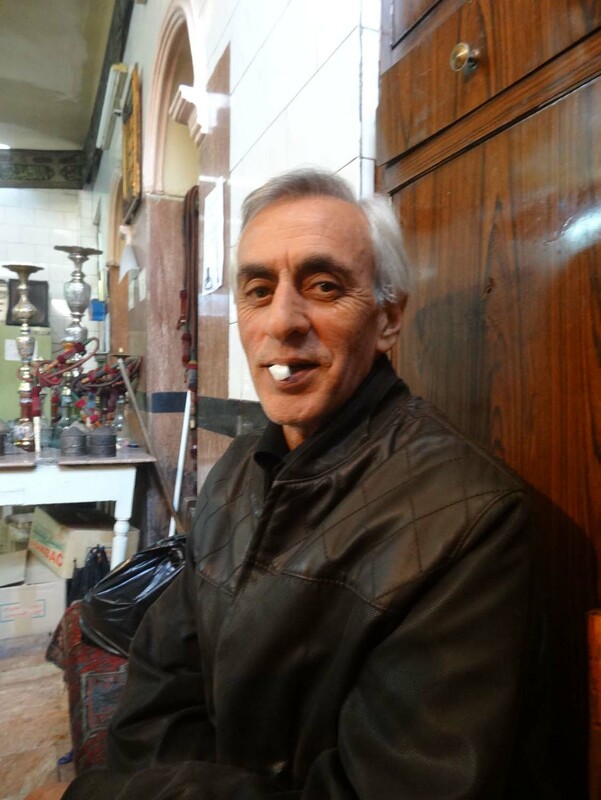 One evening in Tabriz we met Parastoo and Tahir when we were having a drink in a fresh ab (juice) bar. Jude was enjoying kiwi and orange, whilst Jon loved the date mix. We had just bought dinner at a little moving street stall: labu, beetroot and sugar beet boiled in grape juice, a real winter food, when we spotted the juice bar and went inside. We had a great chat and they introduced us to bagla, broad beans served with salt and vinegar, a delicious snack. Jon spotted more shirini (sweets) and asked for a plate. It was another specialty dish from Tabriz, cacao baklava. Simply delicious. 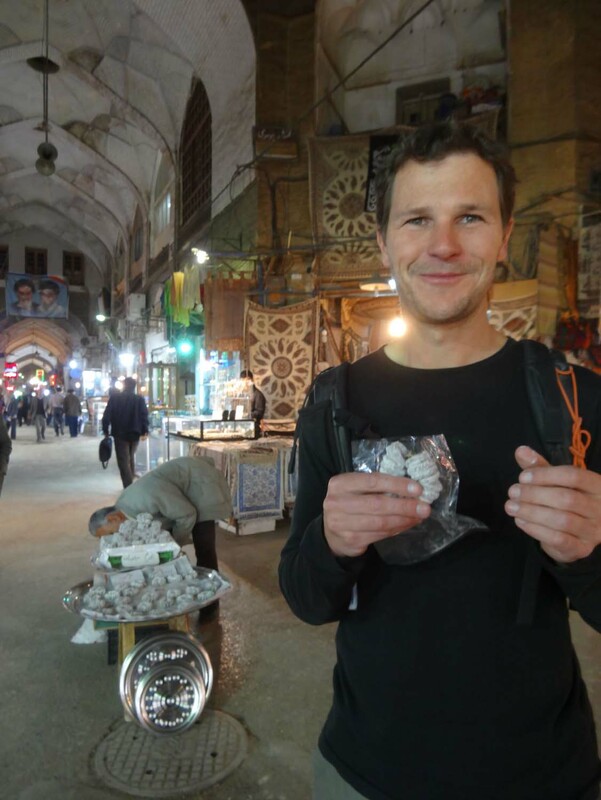 Jon also tried fesenjun and halva and loved it. Fesenjun is a sauce made of pomegranate juice, walnuts, eggplant and cardamom. They usually serve it over chicken, but Jon had meatballs covered in the delicious sauce. Halva is a paste made of sesame seeds and can be eaten with bread, usually for breakfast. 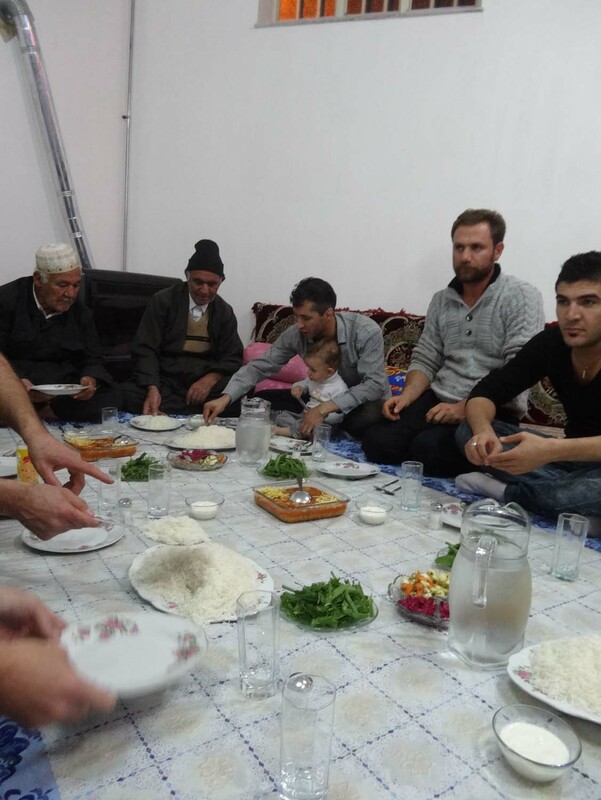 We were also lucky enough to be invited for dinner into a Kurdish family home one evening. We met them at Takth-e Soleyman. 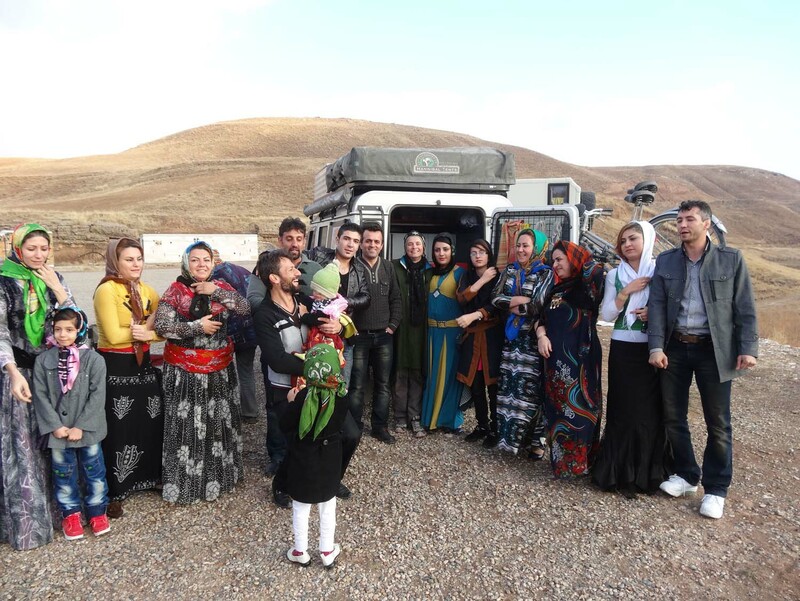 The whole family had driven 50 km to play music and dance in the car park, but when they saw us they became very excited and enthusiastically invited us back to their place for dinner. As we had just met Irmi and Wolfgang, 2 Germans at the start of their 3.5 year overland trip, we all decided to accept their kind offer. Around 40 people sat down for many cups of tea, followed by a delicious dinner. The main course was a delicious dish of lamb, tomatoes, chickpeas and dates, but Jude had plenty to eat too as the side dishes were all vegetarian. Of course yoghurt and bread were also served with the main meal and fruit and more tea afterwards. 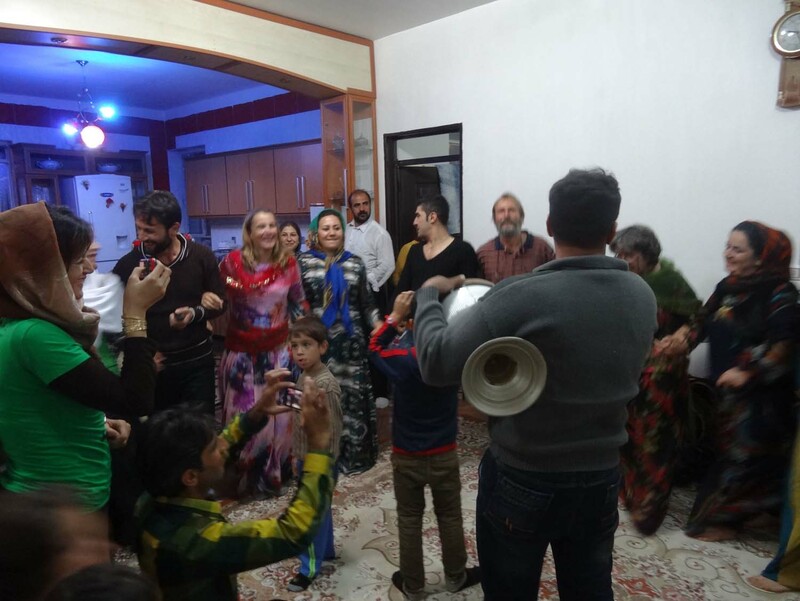 And then the drum came out and 2 of the brothers took it in turn to sing whilst half of the family started to dance the traditional Kurdish way. All arm in arm shuffling to the right with the leading person (male or female) waving a scarf whilst slowly moving around in a circle. Their voices were fantastic and the drumming simple, but very melodious. Of course we had to join the dancing and then Jude was dragged off by the ladies to get changed into one of their colourful dresses, complete with under garments, waistband and scarf. Some make up was added as they loved ‘dressing up’ and then she was paraded into the living room where the dancing continued. Yet more amazing food and an amazing night in this amazing country with its amazing people. 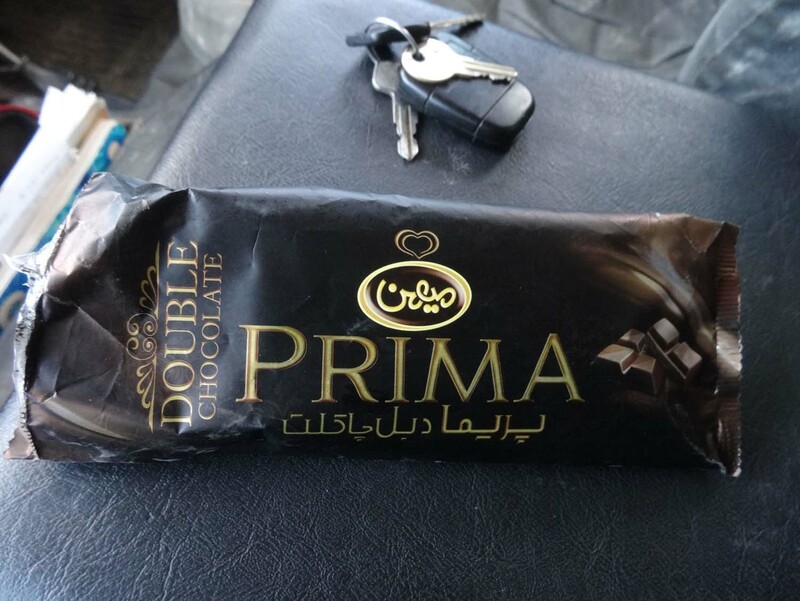 even better than a Magnum! Ah, that’s where my kilos have gone too! 😉 Gee, this is really a sweet heaven and it sounds like you have done nothing else than eating and drinking! I love Jon’s cheeky smile in the pic from bazaar of Esfehan and I hope you have a good picture from you fully dressed up! yeah I have a few more piccies from that night. It was great! een paar rondjes hardlopen maakt daar wel korte metten mee… we zijn nu erg dicht bij. Morgen al in NL!!! We zien jullie snel! So, have you been building a recipe book as you go along. It sound like you will be able to entertain friends for years to come with a different dish every time from your experiences across Middle Earth. We definitely have a few recipes, you should come over once we have a house again somewhere and we’ll cook some for you! Leuk om te lezen hoe jullie het in Iran hebben. Schitterend land en heel vriendelijke mensen he. Reis schiet nu erg op, nog paar weekjes genieten voor jullie, hoewel wij denken dat straks wat luxe heel goed zal bevallen. Geniet nog van het laatste stuk, groetjes uit Alblasserdam van ons allemaal. Morgen zijn we al in NL, dus we zien jullie binnenkort! !